Years ago I found a book on crochet snowflakes that inspired me to learn more and get back into crocheting. My reasons then were so that I could make snowflakes, and here I am today making a variety of crocheted projects. 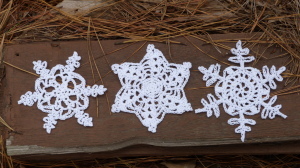 I want to offer you these three original snowflake patterns. Stiffen them and hang them from your tree or give them as gifts to friends and family. The thing about snowflakes is, you never can make just one! This entry was posted on Sunday, November 23rd, 2014 at 4:20 PM by Amy	and is filed under Best Crochet Patterns. You can follow any responses to this entry through the RSS 2.0 feed. You can skip to the end and leave a response. Pinging is currently not allowed.